Housekeeping and laundry services are provided, taking into consideration individual preferences and special needs. Our dedicated housekeeping staff cleans all patient and resident rooms daily. In addition, our staff takes pride in the appearance of the entire facility, ensuring that it is both clean and beautiful. Personal laundry is also collected and washed daily. After washing, the clothes are folded or placed on hangers, based on personal preference. 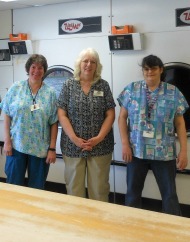 Our laundry staff returns each individual's clothes to his or her room.